The illustrated cover bears a pair of 5¢ London prints tied by a Tullahoma, Tenn., circular date stamp, but the franking is not the point of interest on this cover—the addressee is. The cover is addressed to “Capt. 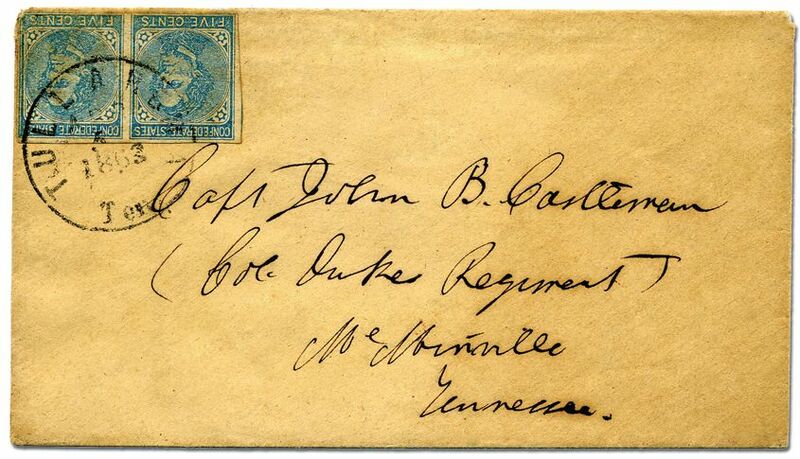 John B. Castleman, Col. Duke’s Regiment, Melvinville, Tennessee”. 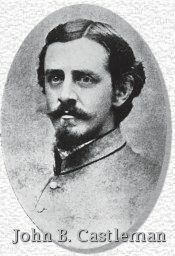 Born in Lexington in 1841, John B. Castleman dropped out of college to enlist and command Company “D” of the 2nd Kentucky Cavalry, a regiment of “Kentucky Orphans”—so-called because their service to the Confederacy estranged them from their home State, which did not secede from the Union. Under the command of the famous raider, Brigadier General John Hunt Morgan, and his brother-in-law, Colonel (later General) Basil Duke, the 2nd Kentucky Cavalry fought in the western theater of operations against the United States Armies of Ohio, Tennessee, and the Cumberland. Castleman’s escapades included attempting to free POWs from Camp Douglas near Chicago and burning U. S. supply boats at St. Louis. In October 1864 he was captured and sentenced to death for spying. The levee at St. Louis was a favorite target of the Confederate Secret Service and their copperhead allies, “OAK”. Not counting Castleman’s action, there are at least four documented instances of multiple-boat burnings at St. Louis during the course of the war. These accounted for the destruction of 18 boats. Although sentenced to death for spying, President Lincoln suspended the execution. After Lincoln’s assassination, Castleman was banished from the United States until pardoned in 1866. Back in Kentucky, he settled in Louisville, obtained a law degree, established an insurance company, and revived Louisville’s militia unit. 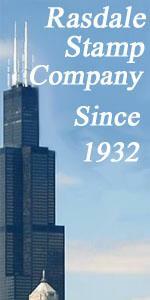 The unit volunteered for service during the Spanish-American War and invaded Puerto Rico. Castleman was promoted to brigadier general and served as military governor of that island. His was the kind of dashing military career that captures our imagination and brings life to the postal history we collect. Although Castleman rose to the rank of general after the War, he is represented in civilian dress in one of only two Civil War statues in the state of Kentucky that depict equestrians. The other is John Hunt Morgan. The 15-foot high bronze statue of Castleman honors his interests and achievements later in life, as a founder of the American Saddlebred Horse Association. His Kentucky troops were, for the most part, mounted on Saddlebreds.